Either way, okra became popular in the American South (and elsewhere, too) -- and it’s a good thing, because it has striking health benefits. The more you know about exercise and the different intensities, the better you can apply these principles. At US Sports Online Strength and Conditioning, we design and deliver customized workouts to take advantage of the different applications of exercise and varying intensities. When you lace up your exercise shoes and head out the door for your morning walk, or push off from the wall of your favorite swimming pool, you're responding to the orders of your conscious brain to move your muscles in a more vigorous way. As soon as those movements begin, however, a number of rapid, automatic changes also occur throughout your body. Your working muscles immediately start to burn more energy to fuel their contractions. They do this by stepping up the conversion of oxygen and nutrients into ATP (the fuel that all cells run on) inside each individual muscle cell. During sustained, aerobic activity, like a brisk walk or steady running, your working muscles might use 15 to 25 times more energy than they do at rest, burning carbohydrates and stored fat in about a 50-50 mix. During an intense, short anaerobic effort, such as running a 100-yard dash or sprinting the length of the swimming pool, your muscles may require up to 120 times more energy than at rest! Your heart immediately begins to beat faster in order to pump more blood to your muscles and other body tissues. During vigorous exercise, your heartbeat may rise to 150 beats per minute or more (compared with 70 or 80 heartbeats per minute at rest, for the average person). Why this happens: As soon you start a physical activity, nerve receptors in your blood vessels, muscles and joints signal your sympathetic nervous system to release epinephrine (adrenaline) and norepinephrine (noradrenaline) into your bloodstream. These quickly act to speed up your heartbeat. The brain's cortex also contributes to this speeding up, in fact, scientists have found that people's heartbeats begin to beat faster even before they start to exercise, as the brain anticipates what's about to happen. The result of all these changes is a vastly increased flow of blood (along with the all-important oxygen and nutrients it carries) to your exercising muscles, including your heart muscle, which receives several times more blood flow than it does at rest. This blood flow is maximized when each muscle relaxes, and then stops as it contracts, creating a "milking" action that helps pump blood throughout your body as you move. Increased blood flow to the skin during light and moderate exercise provides an enhanced cooling effect (you'll start sweating more heavily, as well). Meanwhile, blood flow is temporarily shunted away from the kidneys, liver, digestive system and other organs not directly involved in exercise. Your lungs also begin breathing faster and more deeply, supplying your body with more oxygen. This response results from a wide array of stimuli, including a rise in blood carbon dioxide (the by-product of utilizing more oxygen), increased body temperature and messages sent from chemoreceptors in your body's periphery. At rest, about 12 pints of air pass in and out of the average person's lungs every minute. During vigorous exercise, this rate may increase to as much as 200 pints per minute. Your metabolic rate,which depends on how many calories you're burning, goes up anywhere from four to 20 times your resting metabolic rate, depending on how hard you exercise. Central Islip, N.Y. - In a tightly contested vote, LIU Post came in two points ahead of Bridgeport as the coaches’ favorite in the 2014 East Coast Conference Volleyball Preseason Poll. Bridgeport’s Biljana Savic (Novi Sad, Serbia) a senior outside hitter/setter has been named the Preseason Player of the Year. LIU Post finished with four first place votes and 75 points to top the poll. Last season, the Pioneers earned the program's first-ever berth into the NCAA Division II Elite Eight by winning the East Region Championship. LIU Post returns seven players from the squad that finished with a 25-10 record and ranked No. 25 in the American Volleyball Coaches Association (AVCA) Top 25 poll last season. Bridgeport, who won their second straight ECC title in 2013, also received four first place votes in the preseason poll but finished two points behind LIU Post for the top spot. The Purple Knights, who finished the season with a 22-3 overall record and a 15-1 ECC mark, advanced to the NCAA Tournament for the sixth straight year. Gary Mullin, who takes over for reigning ECC Coach of the Year, Leo Uzcategui, returns a talented roster with only two players and one starter gone from the Purple Knights' 2013 roster. Daemen and New York Institute of Technology received 55 points to come in a tie for third in the poll. Daemen, who is not yet eligible for a conference championship berth as NCAA Provisional members, had a successful first year in the ECC. The Wildcats finished with a 23-10 record and a 10-6 mark in ECC play that would have qualified them for the ECC Championship if eligible. NYIT, who made their third straight NCAA Tournament appearance last season, tied for third despite a huge turnover. The Bears lost seven seniors from last year's roster and only return five players in 2014. Dowling, who comes in at No. 5 with 50 points, received the final first place vote following a season which also ended up with their 12th straight trip to the NCAA Tournament. Savic earns the Preseason Player of the Year honor after capturing the conference's Player of the Year award last season. The three-time All-Conference First Team selection was a versatile player for the Purple Knights, excelling both as a setter and an outside hitter. She finished in the top 10 in the ECC with a .260 hitting percentage, 578 assists, and 5.90 assists per set. She also finished the season with eight triple-doubles, including two in one week to be named the AVCA Division II National Player of the Week. Founded as the New York Collegiate Athletic Conference in 1989 and rechristened the East Coast Conference in July 2006, the ECC was formed to enhance intercollegiate athletic competition among member institutions and to assist them in integrating athletics into their academic program in a fiscally sound way. The ECC is committed to the highest standards of scholarship, sportsmanship, teamwork, and citizenship. Its mission is to promote the total person concept in its student-athletes, which stresses the abilities to excel in academic achievement, athletic competition, and positive character traits. East Coast Conference members include: University of Bridgeport (Bridgeport, Conn.); University of the District of Columbia (Washington, D.C.); Daemen College (Amherst, N.Y.); Dowling College (Oakdale, N.Y.); LIU Post (Brookville, N.Y.); Mercy College (Dobbs Ferry, N.Y.); Molloy College (Rockville Centre, N.Y.); New York Institute of Technology (Old Westbury, N.Y.); Queens College (Flushing, N.Y.); Roberts Wesleyan College (Rochester, N.Y.) and St. Thomas Aquinas College (Sparkill, N.Y.). Associate Members include: Chestnut Hill College (Philadelphia, Pa.), Dominican College (Orangeburg, N.Y.), and Georgian Court University (Lakewood, N.J.). The ECC sponsors the following championship sports: baseball; men’s and women’s basketball; men’s and women’s cross country; men’s and women’s lacrosse; softball; men’s and women’s tennis; men’s and women’s indoor track and field; men’s and women’s outdoor track and field; men’s and women’s soccer; and women’s volleyball. 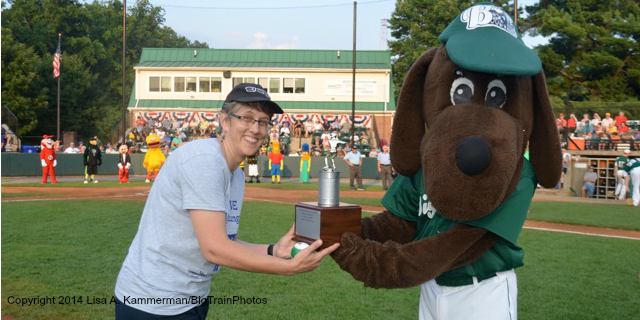 Manna Food Executive Director, Jackie DeCarlo, presents the Feed the Hungry Challenge Trophy to Homer. On Saturday July 12, nearly 80 college baseball players from across the county collected 3,940 pounds of food -- nearly two tons -- for the Manna Food Center. 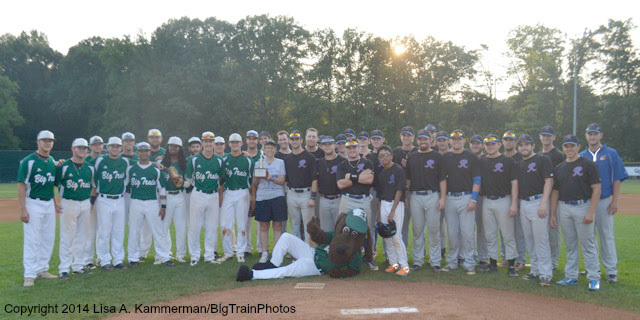 The Bethesda Big Train won the Fifth Annual Cal Ripken Collegiate Baseball League's Feed the Hungry Challenge by collecting 1,198 pounds of food. The Rockville Express collected the most at a single Giant Food Store with 999 pounds. Players from the Silver Spring-Takoma Thunderbolts and the Gaithersburg Giants also contributed to the nearly two tons of food collected. In the five years of the competition, the college players have collected 21,622 pounds of food -- more than ten tons of food for Montgomery County's neighbors in need. Thanks to Manna Food Center, Giant Food, the Gazette, and Text Design for supporting this community service program of the Cal Ripken Collegiate Baseball League. Jackie DeCarlo with the Big Train and Express before their July 12 game. Place the bar across your shoulders and trapezius muscles. Step forward 2.5 to 3.5 feet and drop straight down. Try to keep your forward knee above your foot as you lower your body down as far as is comfortable to you, or until your front thigh is parallel to the ground. If your knee moves out in front of your foot you will increase the stimulus to the frontal quadriceps muscles of your leg, but you will also greatly increase the stress to your knee joint. 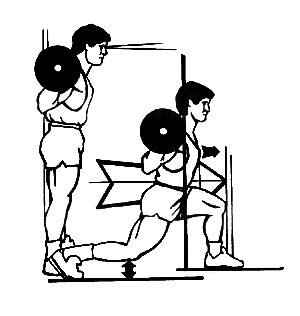 Maintain good posture throughout the lift. Exhale as your push off the front leg and return to the starting position. This is an excellent exercise for developing the muscles in your buttocks and thigh area.
. Just fill out the brief contact form if you would like to get started. BOWIE, Md. - The Central Intercollegiate Athletic Association announced today that Bowie State University head men's basketball coach Darrell Brooks has been elected the new President of the CIAA Men's Basketball Coaches Association. Coach Brooks replaces former president Shawn Walker of Elizabeth City State University. He will represent the men's basketball coaches on the CIAA Basketball Tournament Committee during his term. It is also important to note that both he and Coach John Hill of The Lincoln University serve on the NCAA Division II Men's Basketball Regional Advisory Committee for the Atlantic region. Brooks will begin his sixth season as head coach of the Bowie State University men's basketball program when the 2014-2015 campaign gets underway. The Brooklyn native is a 1979 graduate of the University, as well as a two-year letter winner for the Bulldog Basketball team at point guard. Central Islip, N.Y. - The LIU Post men’s soccer team has been picked as the favorite to win a third straight ECC Championship in 2014 as voted upon by the league’s coaches. Seniors Eivind Austboe (Stavanger, Norway) of LIU Post and Christoffer Olesen (Kristiansand, Norway) of Bridgeport have earned the ECC Preseason Offensive and Defensive Player of the Year awards, respectively. LIU Post, who claimed their second straight ECC Championship and third title in the past five years last season, was nearly a unanimous choice for the top spot with 10 out of 11 first place votes and 119 points. In 2013, the Pioneers tied a program record with 18 victories for the second straight season. LIU Post, who spent four weeks as the No. 1 team in the nation in 2013, begins the 2014 slate ranked at No. 8 in the National Soccer Coaches Association of America Preseason Top 25 poll. New York Institute of Technology, who did not make the ECC Championship but did earn a berth in the NCAA Tournament a year ago, finished with 95 points in the poll to rank second just ahead of Bridgeport. The Purple Knights round out the top three with 94 points. Dowling, which advanced to the ECC Championship Final and also the NCAA Tournament, received the final first place vote and comes in fourth in the poll with 85 points. Austboe had one of the best seasons in ECC history on the way to winning the conference's Offensive Player of the Year award a year ago, scoring 24 goals and dishing off 10 assists for a whopping 58 points. His goal and point totals were more than twice the total of the runner-ups on the ECC leader board and also ranked second in all of Division II. For his efforts, Austboe was named the Daktronics Division II National Player of the Year as well as being honored as a First Team All-American by both Daktronics and the National Soccer Coaches Association of America (NSCAA). Olesen, a four-year starter on the Purple Knights' back line, has earned the coaches' vote as the Preseason Defensive Player of the Year. He started 15 games in 2013 and was a key member of a Bridgeport defense led the conference with only 14 goals and a 0.87 goals against average. Olesen chipped in with three goals and one assist during the 2013 campaign, as well. Three days ago I told you about my new 21 Day Rapid Fat Loss Program that starts 09/01/2014. Well, the response to my 21 day rapid fat loss online bootcamp has been huge. Here's the deal. We only had room for 12 new participants (as this online camp will run concurrent within our existing bootcamp) ...now there's only 4 spots remaining. The 21 day rapid fat loss online boot camp is where you get a customized bootcamp-style workout that will last (three weeks) and starts 09/01/2014. The best results will come if you commit to training 3-5 days per week. Call in sick to work for those three weeks if you have to (just kidding). 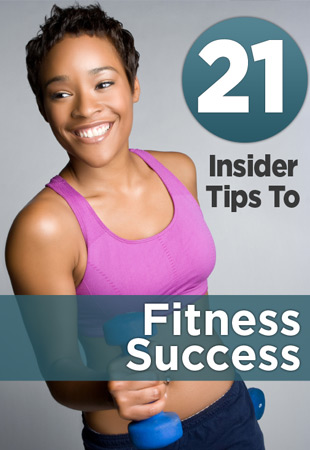 Since it's a custom class everyone will participate at their own level so it doesn't matter what shape you're in... you're going to get amazing results during these 21 days. We're making it FREE from our regular class price of $299 (in person) down to for this special 21 day bootcamp and after 30 days its only 66 cents per day. We're also including a free 21 day personalized, calorie and life style specific meal plan to help you get even faster results. Since the response to this was bigger than I anticipated and since we only have room for 4 more participants we are doing the registration on a first "click" first serve basis. Click here and we will get you registered and squared away. Remember, there are only 4 spots available so it's all about first come first serve. Shop New Hunting Equipment for Less at Walmart.com! Labor Day Sale: Save on Fitness Training Gear! The basic components of a sound fitness program are below. Put these components into a progressive plan for maximum results. The trainers and coaches of US Sports Online Strength and Conditioning can design and deliver your customized strength, cardiovascular, flexibility, and nutrition program complete and ready for you to implement in 24 hours or less. Click here and fill out the free fitness profile form to get started. And then prepare for fitness success! Labor Day Event! Save 15% off any U.S. Spartan Race, Use Code: LABORDAY. 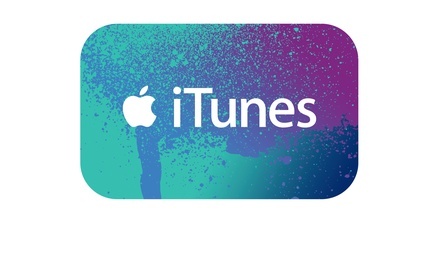 Valid 12:01AM 9/27/14 through 11:59PM 9/5/14. Sign Up Now! Central Islip, N.Y. - The University of Bridgeport women's soccer team, East Coast Conference Champions in 2013, have been picked to repeat by the league's coaches in the 2014 preseason poll. Junior forward Susanne Vistnes (Randaberg, Norway) from LIU Post takes home the Preseason Offensive Player of the Year award for the second straight year, while Ashleigh Berg (Plymouth, Mass. ), a senior back from Bridgeport, was voted the Preseason Defensive Player of the Year. After winning their second ECC title in three years a season ago, Bridgeport received seven of 10 first place votes to finish atop the ECC preseason rankings with 89 points. The Purple Knights, who finished last season with an 18-3-0 overall record, welcome back 10 players to the roster who started at least 10 games during their championship campaign. Bridgeport also beings the season ranked No. 20 in the National Soccer Coaches Association of America (NSCAA) Division II Top 25 poll. LIU Post, with 79 points, narrowly edges Mercy, with 78 points, for the second spot in the poll. Both schools received one first place vote in the rankings, as well. LIU Post made their seventh straight appearance in the ECC Championship last season and finished with a mark of 13-5-0. Mercy put together the best season in program history in 2013, making their first ever appearances in the ECC Championship, the ECC Championship Final, and the NCAA Tournament. Vistnes is awarded the Preseason Offensive Player of the Year award for the second straight season. In 2013, Vistnes lead the Pioneers and the ECC with 14 goals and 34 points. She also finished tied for fifth in the conference with six assists. Her outstanding season led to her repeat selections as the ECC Offensive Player of the Year and a NSCAA Third Team All-American. Berg takes home the Preseason Defensive Player of the Year honor after being a key cog in a stout Bridgeport back-line in 2013. A Second Team All-Conference and All-Region selection, Berg started 19 games for a Purple Knights squad that allowed only 14 goals and a conference-leading 0.67 goals against average. Ready To Get Into Great Shape? Exercise, eating, and fat loss. Your Personal Fitness Trainer On-Call? Are you training enough? Or Too Much? The most Underrated Factor In Fitness..